President Evo Morales signed a law in 2017 that stripped protection from the Isiboro Secure National Park and Indigenous Territory, known as TIPNIS for its Spanish initials, opening it to highway construction and other development. In 2011, indigenous people from the territory staged a two-month protest march to La Paz to stop plans to build a highway through the protected area to link the towns of Villa Tunari, in the department of Cochabamba, and San Ignacio de Moxos, in the department of Beni. 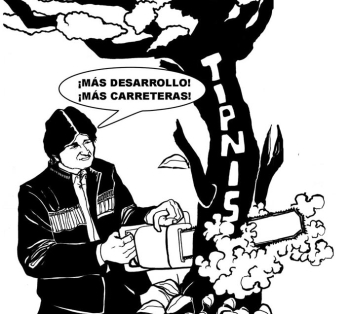 After that march, which met with a harsh crackdown from government security forces, the Morales administration placed TIPNIS under the strictest form of protection. The new law reverses that. Isiboro Secure National Park in the Bolivian Amazon, seen in this 2012 file photo. (CNS) photo/Martin Alipaz, EPA) See BOLIVIA-TIPNIS Aug. 18, 2017. (IPS) – A highway to facilitate traffic from Brazil through Bolivia is to bisect an enormous tropical national park, severely impacting self-governed indigenous communities. No regulations exist for consulting these communities where initiatives affect their territories. They are marching from the Amazon jungle to La Paz, the capital, in protest. Bolivian President Evo Morales’s enthusiasm over the construction of cross-Amazon highways to transport goods from Brazil to the Pacific Ocean has come under fire from academics and from native protesters who have marched from the Amazon jungle to La Paz. His government argues that exporters in Brazil, Argentina and Paraguay need the roads, to cross this landlocked country of 1.09 million square km in west-central South America, to reach Pacific Ocean ports in Chile and Peru and ship their goods to China. The protest is an embarrassment for Morales, a prominent advocate of indigenous rights and the protection of “Mother Earth”. More than three in five Bolivians are indigenous so their backing is crucial to Morales’ coalition, but he is losing their support. Map showing planned route (orange line) of the highway with existing roads shown in red and yellow. One of the roads runs from northeast to southwest, linking Brazil’s Atlantic coast with Chile’s Pacific coast. The Washington Post reports road construction could lead to the destruction of 2,300 square miles (5,950 square kilometers) of rainforest by 2031. Protesters say the road will speed illegal settlement of native lands by farmers from the highlands and fear that coca growers (coca leaf is used to make cocaine) could bring violence to their territory. President Evo Morales says that “If we don’t do it now, other projects will not come to fruition,” the head of Bolivia’s national road administrator (ABC), Antonio Mullisaca, told IPS. Under the glass top on his work table is a colourful map showing roads running across the country east to west and northeast to southwest, like veins and arteries. The government is seeking to facilitate traffic from the state of Rondônia in northwest Brazil to Chile. 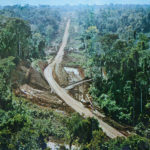 The 1,400-km route would run from Rondônia to Puerto Ustárez on the Iténez border river in northeast Bolivia, through the city of Trinidad, the Isiboro Sécure National Park and Indigenous Territory (TIPNIS), and Cochabamba in central Bolivia, continuing along trunk roads to the Tambo Quemado-Chungara mountain pass on the border between western Bolivia and the extreme northeast tip of Chile. One 300-km stretch along the route, between San Ignacio de Moxos in the northern department (province) of Beni and Villa Tunari in the central Bolivian department of Cochabamba, looks small in comparison to the rest. But it is of extreme significance. It now takes 16 hours to drive between those two points, by a roundabout route through the eastern city of Santa Cruz. The new road would cut the trip to just four hours. 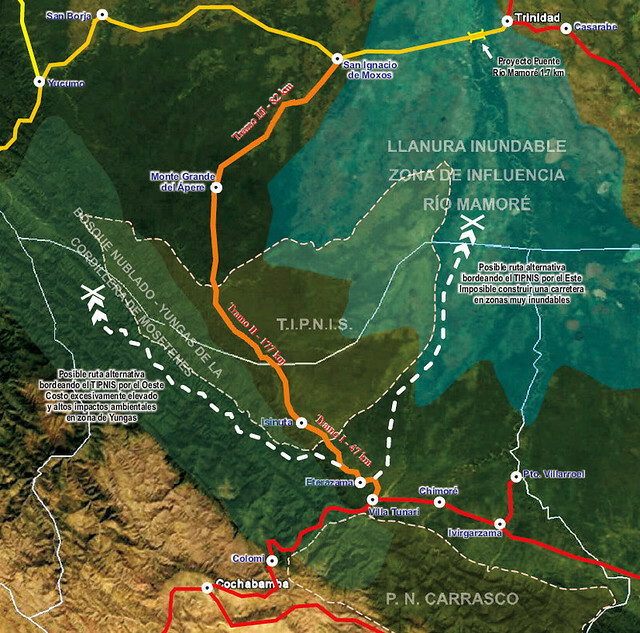 And one 177-km stretch of the road would cross the TIPNIS national park, which covers more than one million hectares and is collectively owned by some 15,000 people from three indigenous groups: the Moxeño, Yuracaré and Chimane Indians. “Our rights are not negotiable,” Adolfo Moye, a spokesman for the TIPNIS communities, told IPS from San Ignacio de Moxos, where the more than 1,000 indigenous protesters marching to La Paz made a halt. The protesters are opposed to the construction of any road running through the park. But rerouting it around the edges would add 850 km to the route. “If we wanted to destroy the park and wipe out nature we would concrete over the whole park—that is not what we are going to do,” Bolivian Vice-President Alvaro Garcia Linera told the BCC. The Washington Post reports Bolivia’s Environmental Defense League (LIDEMA) believes the highway is simply a pretext for oil exploitation in the rainforest. See ParksWatch for a detailing of pressures and threats to the park. The cost of the road, being built by Brazilian construction firm Construtora OAS, is $415 million, 80 percent of which is to be financed by a $332 million loan granted to Bolivia by Brazil’s national development bank BNDES, while the remaining 20 percent is being funded by the Bolivian government. “If Brazil is granting the loan, it obviously has an interest,” Mullisaca said. Bolivia’s total road budget for this year is $500 million, one-third of the annual budget for public works, and hundreds of millions of dollars in loans continue to pour in from different sources, he said. But critics say the road construction project runs counter to the new constitution that went into effect in 2009, which grants broad rights to Bolivia’s historically downtrodden indigenous majority. It also violates National Land Reform Institute (INRA) rules and laws that declare TIPNIS and other collectively-owned land the “inalienable and indivisible” property of indigenous communities, Franz Barrios, an expert on legal matters, told IPS. According to Barrios, the project also goes against the forestry law, the environment law, the regulations for protected areas, the decree that recognised indigenous territories in Bolivia, the penal code, and International Labour Convention 169 on Indigenous and Tribal Peoples, which requires prior, free and informed consultation of indigenous peoples regarding laws or projects like mines, oil drilling or logging that affect their territories. “The government and the sectors interested in fomenting ‘development’ do not seem to understand the content and reach of the constitution,” sociologist Raúl Prada, who took part in the process of rewriting the constitution, told IPS. The indigenous philosophy of “Buen Vivir” – which roughly translates as living well or collective well-being and is recognised by the constitution – refers to living in harmony with nature while pursuing material, social and spiritual well-being for all members of society, but not at the cost of other members or the environment. For the final design of the stretch of road that is to run through TIPNIS, the National Service of Protected Areas (SERNAP), the agency responsible for the enforcement of the country’s environmental laws, must grant ABC an environmental permit, after delivery of an environmental impact study that has not yet been carried out. Mullisaca said that in recent years, so many dirt roads have been carved out in TIPNIS that only one 50-km stretch has no road. These informal roads, the work of outsiders coming in to clear land to plant coca illegally, show that laws designed to protect the environment in Bolivia are not enforced: one more argument in favour of building a paved road through the park, while coming up with a solution to preserve the area, with all the concerned parties, he said. The local communities are actually divided over the road, because coca growers and some trade unions defend the project on the argument that it will boost development. The ABC official proposed, among other measures, sharing revenue from vehicular and cargo traffic through the park with the local communities, and establishing an environmental management plan for TIPNIS. But the central issue is the question of prior consultation with indigenous communities, which should form part of the process of approving the environmental permit, although the regulations for doing so are not yet in place, lawyer Waldo Albarracín, a former ombudsman, told IPS. The right to prior consultation is guaranteed by several articles of the constitution, and by ILO Convention 169 and the U.N. Declaration on the Rights of Indigenous Peoples, both of which have been ratified by Bolivia, Albarracín explained. He added that it is the ABC that is responsible for organising a consultation process that respects indigenous traditions and customs. President Morales and Vice President Álvaro García Linera have urged the leaders of the TIPNIS native communities to engage in talks with the government. But the authorities refuse to suspend work on the road, which has already begun. According to Albarracín, previous consultations with indigenous communities on mining projects were held “using discretional procedures.” He himself advised the association that groups the leaders of native communities from the country’s highlands region, the National Council of Ayllus and Markas of Qullasuyu, during the drafting of the bill on prior consultations with indigenous peoples that was introduced in Congress. The bill outlines procedures to be followed in a binding prior consultation process on actions that could affect indigenous rights and interests, ranging from legislative and administrative measures to any infrastructure project or initiative for the exploitation of natural resources, like mining, logging, oil drilling or the construction of hydroelectric dams. But given the current dispute between the government and indigenous communities from TIPNIS, Albarracín does not believe the bill will pass any time soon. Prada said the road forms part of the Initiative for the Integration of Regional Infrastructure in South America (IIRSA), which has bolstered Brazil’s presence in sectors like the oil, hydropower and construction industries, in the face of an attitude of “subordination” on the part of the Bolivian government, in his view. Whatever happened in the past is because we were less evolved than we are now. It is time to wake up the world as to what is causing the Amazon crisis, and for humanity to evolve to the next level of higher intelligence. Humans cannot continue to consume animal based products, which is what is causing the destruction of the rain forests. All the protests in the world cannot help this situation unless people stop using animal products as food, clothing, etc. 1. We are currently facing one of the greatest mass extinctions ever to occur on Earth. Over 30 percent of the biodiversity on this planet has been lost since 1970. In the tropics, we’ve already lost over 60 percent of its biodiversity. A study conducted by the United Nations found that the rate of current plant and animal extinctions is over 1000 times the natural rate of extinction. This is by no means a natural phenomenon. The majority of these extinctions are due to abolition of the rainforest in order to grow soy and corn to feed livestock. 2. Brazil is the largest beef industry in the world; the country produces roughly 7 million metric tons of beef every year from a total population of 165 million cattle. 4. Rampant deforestation for cattle-raising is becoming popular in Central America. Since 1960, more than 25 percent of the area’s rainforests have been cleared for pastures alone. 5. The United States is the largest beef importer in the world, importing beef from Uruguay, Australia, New Zealand, Canada, Brazil and most recently, Costa Rica. Many US livestock companies are reported to have purchased tracks of rainforest in Costa Rica for cattle-raising, which is sold back as beef to the United States. 6. The Cerrado, or Brazilian Savannah, is home to 5% of global biodiversity, but is being rapidly converted into farmland used to produce soy to feed agricultural animals. 400 square kilometers of the Cerrado is cut down each year to meet beef demands in the UK alone. 7. Overstocking and overgrazing leaves the land depleted of most nutrients, which accelerates desertification. Chopping down the irreplaceable and wonderfully gargantuan rainforest trees results in the abolition of our huge carbon dioxide conversion tank and the world’s primary oxygen supply. 8. If global warming rates continue as they currently are, within a few decades the earth’s temperature will rise 3.5 degrees C. This will be enough to complete destroy the Amazon Rainforest and further accelerate the rate of global warming, the melting of the ice caps and the rise of sea level, obliterating costal human habitats. 8. If global warming rates continue as they currently are, within a few decades the earth’s temperature will rise 3.5 degrees C. This will be enough to completely destroy the Amazon Rainforest and further accelerate the rate of global warming, the melting of the ice caps and the rise of sea level, obliterating costal human habitats. Herbivores who eat animals just because they like the taste are not human. Meat eating was done for survival to avoid death, not for sport. We are 100% herbivore by design, and by behaving as such, we will have a future. Otherwise we go down in disgrace.